When I was growing up in Maine, there were certain constants. 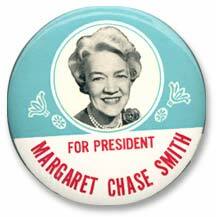 There would be lots of snow in winter, lots of lobster in summer, and lots of Senator Margaret Chase Smith year round. I’m older now, there’s less snow, which I like, and I can admit to never having like lobster much, but in this most disgusting of election years, I sure wish that the very sensible Senator Smith were still around. Let’s digress for a moment before I get to the point of this post. Even here in sensible no-frills Maine, a state of only a million or so people spread out over a large geographical area—where it sometimes seems everyone knows everyone else—we are not immune from the sheer nuttiness and relentless nastiness that has characterized this election year, more than any other that I can remember. Maine has tended to be a politically moderate and tolerant state, and whether Republicans or Democrats were in charge, things were always pretty much business as usual. No longer. The Palin and Tea Party wings, strident, proud, loud, and not always logical (like almost never), have taken over the Republican party, shoving its moderate wing out of the way. The moderate wing, marginalized, has mostly gone Democrat or Independent. A loud mouthed, foul tempered buffoon who could not have made it past the primaries a few years ago, is the Republican candidate for Governor. His campaign has been characterized by tantrums, loud invective, and half baked populist claptrap that sounds good to people who have been listening to too much talk radio, but makes little sense when actually put to the logic test. You may be thinking ‘ah, the Dilettante is obviously one of those bleeding heart liberal Democrats’. Right you are, and proud I am, but sad to report, the Democratic party is Maine is also not safe from my contempt this year The state has been controlled in recent years by the Democrats, even through the late Bush years. The most recent governor, a former senator, has been the most tepid and invisible and ineffective in my forty years of paying attention to state politics. The current Democratic candidate for Governor, the first woman house majority leader, is sensible and polite, unlike her Republican opponent. Unfortunately, she is also a business as usual politician with few strong ideas. She has also been dragged down by a new nastier side to the Democratic party, apparently trying to emulate the Republican attack methods. She is splitting the majority moderate vote with an Independent candidate, a lawyer and former lobbyist, is by far the smartest kid in the room, and the one with the best articulated and sensible ideas. He has also been running the politest campaign. Sadly, sensible doesn’t fly this year. Long story short, although only something like 35 per cent of the voters want the mean candidate, the other sixty five per cent is split, in order, behind the Democrat, the Independent, the fringe candidates, and our old friend, the Undecided party. Only a miracle will elect one of the sensible candidates. 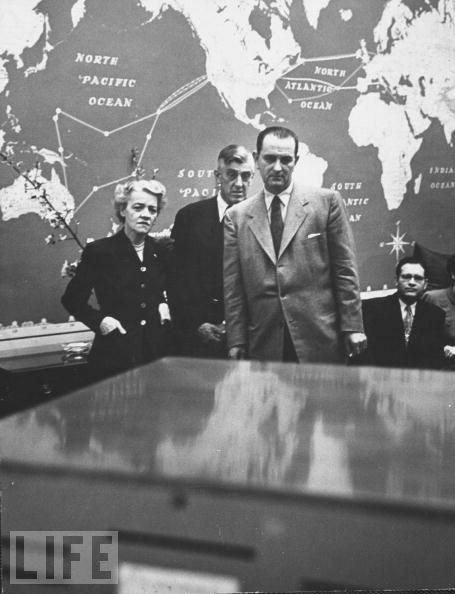 Margaret Chase Smith was born in 1897 in Skowhegan, Maine, a pleasant small city on the Kennebec River, the last big town on the Northern route to Canada, whose other chief claim to fame is having been the location for Paul Newman’s film version of Empire Falls. She was of that first generation of woman who came to age with the suffrage movement. As a young woman, she worked as a teacher in a one room school house and sa telephone operator. 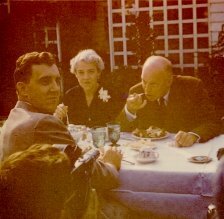 She married Clyde Smith, a well to do and well respected local politician in 1930, and went to live in his big old second Empire mansion in Skowhegan, all varnished woodwork and stately gloom. 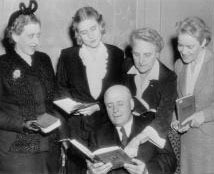 When he was elected to to Congress, they went to live in Washington, where in due course Mr. Smith suffered a heart attack, and before he died, urged that his wife, who had served as his assistant, be elected to his seat, and in 1940, she was, becoming the first woman in Maine to serve in the house. 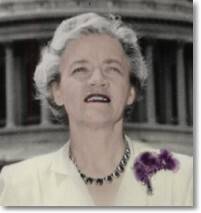 In 1948, she ran successfully for the Senate, becoming the first woman to serve in both houses. As a senator, had a long and successful career, ranking 11th in seniority, serving until 1973. She was famed for her clear speech and thought. She said what she meant, and meant what she said. And here we get at last to what brought moves me to write this post. As I look with horror at the money unleashed by the actions of the Roberts Supreme Court now flowing even into local Maine elections, and consider the Palinesque nuttiness that has overtaken the Republican party, I have found myself thinking a great deal about Senator Smith’s finest moment. It was June of 1950. The country was in the grip of McCarthyism, red-baiting and communist witch hunts, and madness and fear dominated the political scene. Sound familiar? The difference was that someone from within McCarthy’s own party was willing to stand up and say ‘enough is enough’. That someone was Senator Smith, and her ‘Declaration of Conscience’ is considered one of the finest speeches of the 20th century. A plea for a return to common sense and fairness in the Republican party, it also, without naming him, took direct aim at Senator McCarthy’s tactics, and was the beginning of the end of his reign of terror. It was a brave and lucid speech. Senator Smith once famously said that her method in speaking was to speak very slowly, very clearly, using simple words and giving her listener plenty of time to think about her points, all in her clear, lady-like Maine diction. In it she stated her belief that the Republican party was necessary to the well being of the country and the two party system, but that: “to displace it with a Republican regime embracing a philosophy that lacks political integrity or intellectual honesty would prove equally disastrous to this nation. The nation sorely needs a Republican victory. But I don’t want to see the Republican Party ride to political victory on the Four Horsemen of Calumny—Fear, Ignorance, Bigotry, and Smear”. 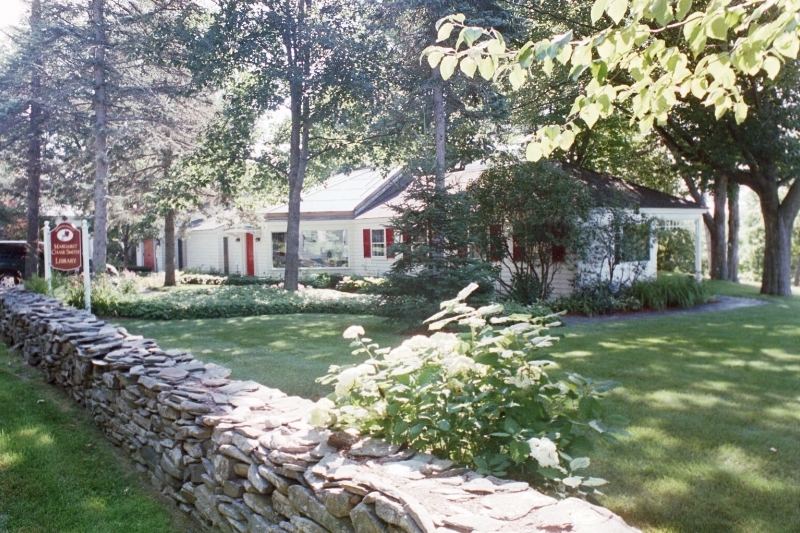 In 1972, in her mid-seventies, she was defeated for re-election, and retired to the simple ranch house she had built on a bluff overlooking the Kennebec River, and died there in 1995. Her house is now a museum with library adjoining. 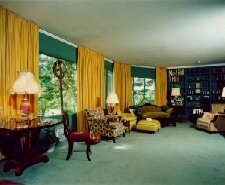 The house, designed by Harriman Associates, will win no design awards, but is a perfect time capsule of its era, and a moving testimony to the remarkable woman who lived there. I am not the only one who has been thinking longingly of Senator Smith and her high-minded politics. Here is Katrina Vanden Heuvel, editor of the Nation, on Margaret Chase Smith and the Declaration of Conscience. I’ll be spending the next few days in mourning for the loss of commons sense in politics, but I promise, nothing but houses and decoration for a few weeks after this political interlude. As a non American I find it very sad that your country is so polarised, and that the way of expressing views by both left and right of politics is so violent, and largely quite ignorant, certainly of both sides of the argument. I think I'm not alone in seeing this unfold, and wondering where it will take America. Clearly you, and many hundreds of thousands of sensible Americans think the same way. There has to be a middle ground. Furthermore in Western European terms "Liberalism" is not a dirty word, but it seems to be one that equates to "Communism" in America. Indeed we believe America was founded on liberalism: "Liberalism (from the Latin liberalis, "of freedom") is the belief in the importance of individual liberty and equal rights". The opposite would be Fascism; perhaps there is a fork in your country's road. I wonder which one it will take. TDED –It's fine to lament the passing of Liberal Republicans, but remember that Conservative Democrats have met the very same fate. Each batch has been gradually winnowed out by the more extreme, ideological elements in their own parties, who are increasingly intolerant of any form of dissent from Received Opinion (as they conceive it.)P.S. I feel obliged to point out that if Katrina vanden Heuvel woke up to find herself editor of The Nation in 1940, 1950, 1960 or 1970, she would have regularly commissioned articles attacking the likes of Margaret Chase Smith. For her to praise Smith now is like the editor of National Review lamenting the loss of figures like Sam Nunn. The nicest thing you can call it is "disingenuous." Forgot to add a thank you for having unearthed MsChase-Smith's jaunty campaign song as perpetratedby the irrepressible, faintly absurd chanteuese extraordinaire, Hildegarde. If anything can take us back to another era and an altogether different mentality, it was the odd choice of Hildegarde to convey a political message~with satin gloves on. >Loved the picture of Mrs. Smith with the other prominent women of the House of Representatives. Please do some research on Frances Bolton, OH Congresswoman for many years, along with one of her sons, and they made up the only mother-son team to serve in the Congress. Her Standard Oil forebears were early denizens of Palm Beach and of Prouts Neck ME, hailing from Cleveland OH. The family still lives large but has set a wonderful example by giving generously thru the years (centuries, actually) to various cultural and educational institutions.